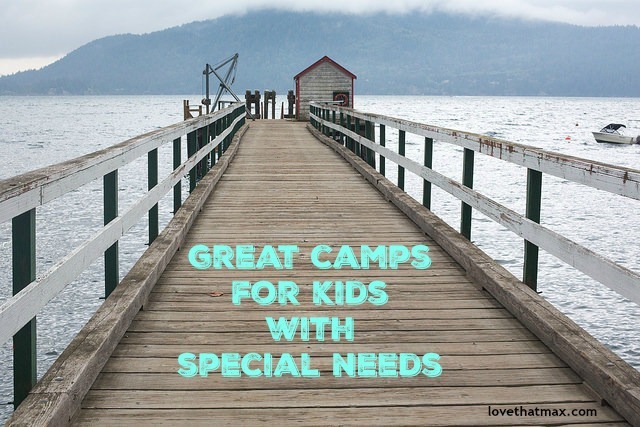 A resource list for exploring summer camps for kids with special needs. Feel free to mention any great camps in the comments that your child has been to, and enjoyed. KidsCamps.com also lists camps by state, and specifies the types of disabilities accommodated. Federation for Children with Special Needs lists camps for kids with special needs by disability. Foundation For Jewish Camp has a list of camps for Jewish children with special needs. Ones I can vouch for: Yachad's summer programs and the Ramah Tikvah program, which are both inclusionary. I have also heard good things about Camp HASC in Parksville, NY, which follows IEPs. A couple of notable camps for children and teens with special needs in the tri-state area, my neck of the woods: Southampton Fresh Air Home in Southampton, NY; Elks Camp Moore in Haskell, NJ; Camp Fatima in Harrison, NJ; and Double H Ranch in Lake Luzerne, NY. And one camp I recently found out about that looks great: Victory Junction, in Randleman, North Carolina, for kids with serious illnesses (they offer a week for campers with cerebral palsy). We are going to be doing Camp Yofi at Ramah Darom this year for the first time! I learned about it thanks to your blog so thank you! Already been in touch with another family who has done it for years and gave it rave reviews. Kiwanis Camp Casey in Washington State is for kids with physical disabilities and is AMAZING. Hasc is amazing. 7 week sleepaway camp with integrated school and amazing fun activities. Amazing. Victory Junction and Double H are both part of a worldwide network of camps called the SeriousFun Children's Network. Many of the camps focus on kids with medical conditions (blood disorders, metabolic diseases, cancers, organ transplant's,etc) but each camp has different sessions and serves a variety of conditions so there are sessions for kids on ventilators, for kids with craniofacial differences, burns, etc depending on the camp. SeriousFunnetwork.org has info on all the camps worldwide for more information. They adhere to very high standards for safety and programming and have incredible staff. Kamp Dovetail in Hllsboro, Ohio is awesome! I have CP and my parents sent me to a summer camp for people with physical disabilities. I did not have the best experience because it was a integrated camp and we (the special campers) were patronized by the other campers, the staff sometimes seemed like they were taking extra precautions like making us wear to harnesses instead of the standard one, we had less activities to do than the normal campers. Personally I have more challenges with using my hands the walking but the program was more focused on people with trouble walking. My mother had tried in the past to enroll me in Easter seals but I was rejected because I had no limitations around walking but I needed a considerable amount of help with eating and dressing, My advice would to try a camp but change for the next summer if the child dislikes it find a new camp. Are there any camps for children with Autism, SLD.....?